The right people can make or break a company. That’s great news for the self-employed, but unless you have a workforce of one, staffing is a major perpetual concern. Sad but true: your employees won’t stay forever. There is only option: you need an employee referral plan. More than just a recruitment strategy, it’s an all-inclusive approach to engage your workforce and streamline your recruiting, all while saving time, money and effort. 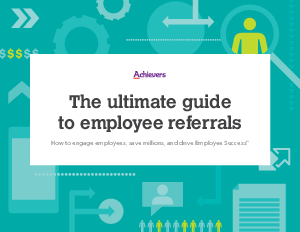 In The Ultimate Guide to Employee Referrals you’ll learn how to implement an employee referral program that can help you acquire top talent at a fraction of what agencies will cost, all while strengthening your unique culture of Employee Success™!